I have been fascinated with Weird Tales for a while now. There wasn't nothing like it where I grew up, and nowhere to learn anything about it. 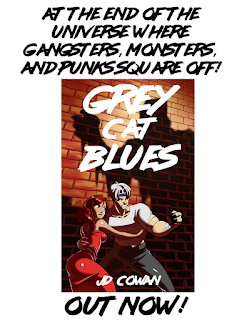 In a world starved for unique, bizarre, and fun fiction with a bit of brains, we appear to either have Big 5 published grey gruel pushed on us or are forced to journey out into the wild world of independent publishing and barrel through the brush to seek it out. There is no more cohesive library for fans of the phenomenally fantastic to find what they want. So most people walk away. We see that trend continuing year after year. Genre fiction is dying. If we want to save it we have to go back to the source and see what we're missing and what we can regain from the era that was the most prosperous. That time period, whether you want to admit it or nor, is the pulp era. Appendix N proved that there was a very obvious canon of fantastical tales that influenced a whole generation to the point that they were building games in order to play in those worlds. Sure, one could argue that Appendix N was only what Gary Gygax preferred, but it's not worth arguing and is clearly not true when speaking to those that lived in that era. Looking at any account of fiction fans of the time one would be hard-pressed to not see mention of Edgar Rice Burroughs, Abraham Merritt, Henry Kuttner, H.P. Lovecraft, Leigh Brackett, E.E. "Doc" Smith, Manly Wade Wellman, Edmond Hamilton, Clark Ashton Smith, C.L. Moore, and Robert E. Howard. These names were conveniently erased over time by those who wanted to use genre fiction for something other than escapist entertainment and for something considerably less inspired and far more idiotic. Those that did survive were tarred and feathered, and essentially read out as the wrong sort to read. Even to this day you will have those refusing to read writers from the Golden Age of genre fiction because of hearsay and rumors, and not because of any story they ever wrote. In fact, the term Golden Age itself was co-opted for use for a later generation that did not influence nearly as much as the pulps did. That bit of deceptiveness has cost much over the years. Just as Superman is the Golden Age of comic books, John Carter is the Golden Age of genre fiction. Take it or leave it, but it is what it is. This needless erasure is a shame, because what they wrote is quite good. Phenomenal, even. You can even find these stories for free, as most are in the public domain. You can even easily find information on these writers if you are so inclined. The pulp era Golden Age is more accessible than ever before, and every reader is free to make their own decision on how well they hold up. 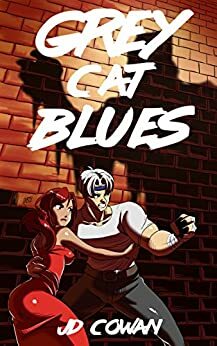 Right now, you can go on amazon.com and buy a pack of 26 stories by most of these authors for $2. That is less than you'll pay for the most recent forgettable John Scalzi book, and you will be offered some of the best stories you've probably never read. And they are quite delightful. You will be able to read stories without artificial genre boundaries and where you will be pulled into a world much like ours only from an angle you might not have considered. No politics, no preaching, no pointless perversion. Just fun and a good time. And real fantasy and fun. None of John W. Campbell's trying to make fantasy fiction "realistic" or trying to take the grandeur and teeth out of the action. There was a magazine for that called Unknown. It didn't last very long, and yet its influence is puzzling. But that's a whole other topic. This post is about the real best magazine in fantasy, one that lasted much longer. This is about Weird Tales. Personally, I was stunned reading these. I know I've said that a lot since going on this journey through the old canon and missing link between adventure classics like Haggard and modern pulp like the original Star Wars movies, but this time I mean it. Let me go through each story to show you. In this post I will go through the first 13 stories of 26 and will save the remainder for a follow-up post. As you can see, it's a very varied list that spans a good amount of time. And the stories themselves are also quite a decent spread of Weird Tale goodness. They hold different settings, characters, and ideas, with the only constant being that they are limitless tales of the unknown. They can go anywhere and do anything. Beyond the Black River by Robert E. Howard is a Conan story involving a plot to slay a wizard, an advancing force of Pictish invaders, and demon monsters summoned from the depths. Conan faces insurmountable odds, but he doesn't face them alone. If there is a better story to start off a Weird Tales anthology than a Conan story I severely doubt it. You get your action, drama, and eerie feels here with an ending that will grow hairs on your chest. This sets the tone going forward. 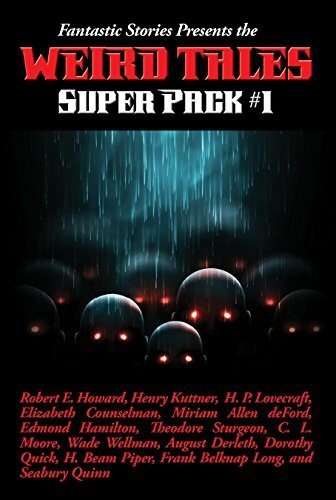 Henry Kuttner's The Secret of Kralitz is a Gothic Horror tale in the Lovecraftian mold starring a line of barons that teeter toward an indescribable fate. It takes a bit to get rolling, but once you reach the end you'll almost wish it were longer. This is a part of the literature tradition modern genre fiction has all but gutted. The creeping unknown of what you think is and might be falls upon you like it does the protagonist. Gothic influence is regularly ejected in favor of nihilism these days, and that's a shame. The old tradition offers so much more to the reader. But then we get to who is probably the most well-known author here. That would be H.P. Lovecraft and his story The Shunned House which is business as usual for him. It starts with a detailed history of the house in question, reminding the reader of The Dunwich Horror published nine years prior though actually written first, giving off the vibe of an historical document more than a short story. Unfortunately, unlike that story, the beginning is far too long-winded and most of it is inconsequential to the best parts of the story. However, I would say the second half is a better story than Dunwich if only because the protagonist is heroic, works to solve the problem, and actually succeeds in the end despite his circumstances. As such, this is heroic fiction and was exactly what this reader enjoys the most. There really was no writer quite like Lovecraft. We then jump to the 1950s with Mary Elizabeth Counselman and her story Way Station which is unrelated to the Clifford Simak novel of the same title. A newly wed couple enters a motel and learns the inhabitants inside may not be what they seem. This story managed a balance of eeriness and lightheartedness that completely disarmed me when reading. I had guessed the secret early, but that was apparently the point, as the plot then went beyond it for a warm ending that easily made up for what predictability there was. This is the first story I've read of hers, and it probably won't be the last. Never Stop to Pat a Kitten by Miriam Allen deFord was such a pleasant delight that I had to pause after reading it to reconfirm this story did exist and I didn't just make up reading it. Essentially, a man stops to pet an adorable kitten on the street and the bizarre begins to occur. I don't want to spoil exactly where it goes, but this is what I think of when I think of the term Weird Tales. They just don't make them like this anymore. After that we go into a similar piece by Paul Compton called The Diary of Philip Westerly. This involves a dark reflection in the mirror that grows more plain as the protagonist grow more demonic. 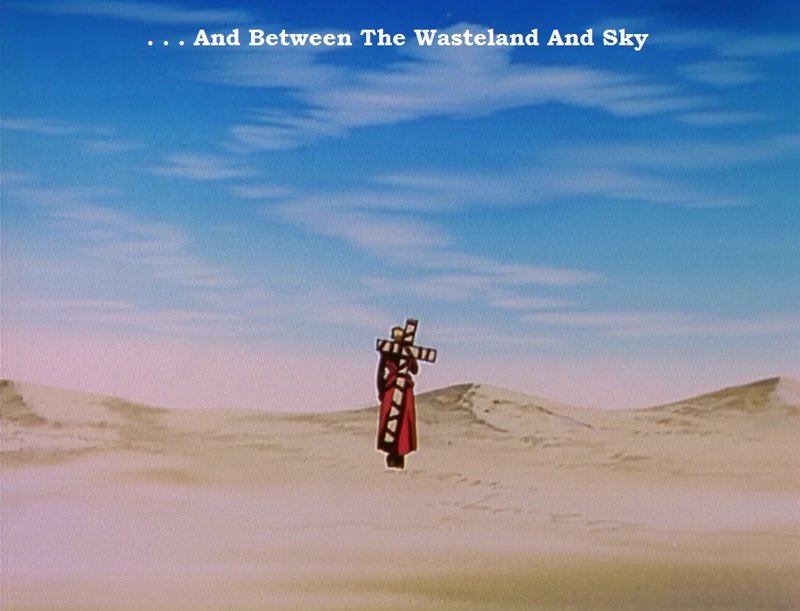 This felt far more like a vignette than I would have liked with an ending that didn't really go anywhere. I was reminded of The Portrait of Dorian Gray, but whereas that involved a beautiful man with a stained soul, this didn't really explain what sort of man the lead was to tell me if I should root for him or understand his plight. The stakes are more assumed than anything and he is a very insular man which makes understanding his decisions difficult. It was good, but the ending was definitely weak. But then we reach what might be my second favorite of the bunch (you'll know my first soon enough) by Edmond Hamilton, the planet cracker, world wrecker, and sphere smasher himself. But this is an action pulp called The Door into Infinity and not Space Opera. And man alive is it incredible. Mr. Hamilton could switch genres like he was changing shirts. Secret societies, beasts from beyond time, knife fights, daring escapes, and dread fill this piece from beginning to end. If there was one story that slapped me in the face and told me to keep the pages turning, it was this one. Next is Lloyd Arthur Eshbach's Isle of the Dead. This actually ran a month after the previous story did in the original run of the magazine. A yacht comes across a mysterious island of zombies and the poor lost protagonists must figure a way out as everything goes to hell. Keep in mind that these are not typical postmodern George Romero zombies, but old school dead and bloated corpses moving on their own as if from some unseen force with a purpose. This is another full tight adventure story that is actually surprisingly graphic even today. It isn't for the squeamish! Pure horror. Nonetheless, it's a good one. Theodore Sturgeon's The Perfect Host follows. This one also took me a while to get into. Each part is named after a different character with a different point of view to a series of events. Basically, a sick woman leaps from the balcony of a hospital and dies . . . or did everyone see what they thought they did? Even the pulps could try literary tricks, and this story is a prime example. Though it does have the problem of a couple of the characters rambling a lot and taking time getting to the point. If this was done in a novel it would absolutely drive me mad. Experimental ideas like this really do work better in short form. That said, this is what you read Weird Tales for. Gainful Employment by Jamie Wild is next and is the only story here from the year 2000 and outside of the original run of the magazine. The fantasy setting leads way to a tongue in cheek comedy with dialogue to match that could have come from The Simpsons or Monty Python's Flying Circus. The main character meets a dragon who gives him a job. He completes the job then gets another one. It's a fine enough cutesy comedy, but there is nothing about it that screams Weird Tales and could have easily run in any other magazine. There is no weight, no drama, and no eerie atmosphere, that even the lighter stories have. The story is a subversive take on a knight's quest which goes pretty much where you think it will when the dragon starts talking back to the hapless main character. It's just a solid comedy fantasy story that is clearly from the '90s/'00s. If that's what you want, then this is for you. But it's not Weird Tales, or pulp, and it shows how far away short stories have been pulled from that tradition over the years. But right away we're pulled into The Tree of Life by one of the finest writers of genre fiction that ever lived. That would be C.L. Moore, and this is the best story in the collection. This a tale of Northwest Smith, the obvious inspiration for Han Solo, as he deals with a ruined civilization and what may in fact be the darker remnants. Instantly, the weight missing from the last story returns as does the Weird Tales perfect blend of Science Fiction, Fantasy, and Horror in one perfect amalgamation of a story about beauty and danger that are so close and yet just out reach for mortal man to grasp. I have never come across another writer that had perfectly captured this mood than C.L. Moore did. One of the worst things to happen to genre fiction was this loss of intense Gothic mood that allowed so much flexibility in what stories could allow. Needless to say, this is one of the best stories in this collection eve if you're not big on the Gothic style. Space bounty hunter hunts down an abomination. That's all you need. The oddly named Mop-Head by Leah Bodine Drake follows. A woman marries a young widower and one of the kids just doesn't take to her. But then something called "Mop-Head" begins to get involved with their family and everything gets turned on its head. Leah Bodine Drake was mostly known for her poetry and this is one of two short stories she actually wrote for Weird Tales. It's a shame she didn't write more. This was well worthy of printing as a creepy horror story with one odd monster that will make your skin crawl. Lastly, we have a story by the great Manly Wade Wellman to end this post on which is The Golgotha Dancers. The tale is about a haunted painting where those inside come out to terrify the owner. Wellman's eccentric prose style really helps this come alive. The specific inscription on the painting is what really got to me. It was simple, but memorable. "I sold my soul that I might paint a living picture." Of course if you've read a haunted painting story before you more or less know where this is going, but let's also be honest. No one under the age of 40 has probably read a haunted painting story unless they went looking for it. Like I had to. Nevertheless, it makes a good addition to this collection in rounding out the story selection for a story well appreciated. If the ending doesn't make you smile then you simply have no heart. These stories do make me wonder about the narrative that women were discriminated against in the pulp era. A good portion of those included in this pack, and in Weird Tales' actual pages, were women and known to be women, and the magazine enjoyed high sales regardless of that fact. They also wrote better than many of the writers put out books for the big publishers today. And everyone was fine with it. It also makes me wonder just why the success of Weird Tales has been downplayed by certain individuals in the industry. The relationship between its tremendous success and its forcible removal from influence in Western genre fiction is baffling. It sold far more than the John W. Campbell attempt at gutted Fantasy and has a had a bigger effect worldwide on genre stories in literary form and other mediums than anything Campbell pushed out. So why did Unknown have more influence on the North American literary market when the audience wanted stories like Weird Tales and not more like Unknown? Why were the audience's wishes ignored and told what they were supposed to read? Why were writers encouraged to travel paths the majority of their readers didn't want them to go? Does this correlate with genre fiction's segregation into tiny fan clusters (fetishizing certain subgenres to the exclusion of its much deeper roots) while the larger audience simply walked away from their ghetto? Is that why sales keep dropping year after year and continue to get more and more insular? It sure seems like pulp is what the audience wants as the success of anime, detective stories and mysteries, video games, manga, bande desinee, superhero movies, and the continued popularity of old Star Wars and '80s genre films show. All of which were heavily indebted to the pulps and all of which enjoy more success than what followed Campbell's example. Something isn't adding up, and it goes surprisingly far back. It is plenty suspicious. But that's enough of that. I'm getting off track. We will see how the rest of this collection goes when we reach the second part. I'm eagerly awaiting getting to it. As for pulp inspired works, I have my own out there now. You can check it out at the link below and tell me how I'm doing! My Hero Academia is back, and as the cover shows, there is a lot to go over here. This review is going to be filled with a lot of spoilers for material to come in season 3 of the anime so if you don't want what is sure to be the greatest moments in the series spoiled for you-- tune out now. Those still with me had better hold on tight. As has been mentioned previously, My Hero Academia has an unwritten creed that every volume of the manga that does not have Izuku Midoriya, the main character, on the cover means the focus of the volume is centered on whoever is. This was the case when we learned about Todoroki's past, and the truth behind the chip on Bakugo's shoulder (which seemed innocuous at the time), back in volumes 5 and 7 respectively. 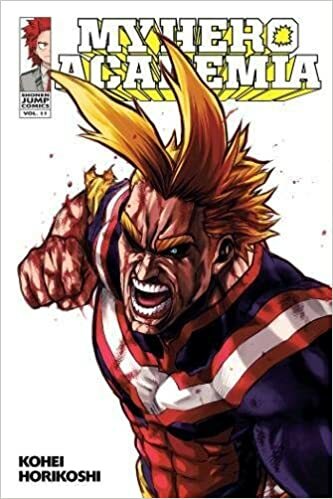 This volume having not only All Might on the cover, but in the middle of a desperate battle and covered in blood, as well as the official title being "End of the Beginning, Beginning of the End" is a mark of how important its contents are to the overall narrative of the series. Of course, it's also a really cool looking cover. Kohei Horikoshi always nails these out of the park. Even with the spoiler warning I already gave, it is difficult trying to explain this volume without ruining the impact. You really should read it first. I'll just get right to the point. All Might is the Symbol of Peace in the world of My Hero Academia. He is the Superman. He represents the Golden Age of superheroes as a whole. He is the man who faces danger with a smile on his face and is always there for people at the world's darkest moments. He is the symbol of a bright era where heroism and light has lead humanity forward from those in the shadows languishing in anger and bitterness. He is a symbol of something much bigger than he is. This is also what eventually comes back to bite him in the back. All For One, the enemy of the original holder of the One For All power, has made his move in order to save Tomura Shigaraki and his men from being captured by the heroes. He has chosen this moment to make his final stand and allow his student to escape before everything is ruined. The ones hiding in the shadows have been amassing forces and power, building their time for the right moment to strike while everyone else went on oblivious at what they were doing. They used Hero Killer Stain's warped ideals to further their own cause and sent the heroes in disarray after attacking a summer camp for kids that they should not have known about. The villains are turning the tables. The era is changing fast. And All Might knows it. Though he exchanges blows with All For One, the two quickly learn that they are both not what they used to be. All Might no longer has the stamina he used to since he gave away his power to Midoriya, meaning he is living on borrowed time. All For One's body is not immortal despite all the quirks he has stolen over the years. He is rotting away. His body is a horrible mangled sack of skin and bone that is barely shaped like a person anymore, and it can barely contain or use any of his powers like it used to. These two titans know this is their last battle, and they put all they have left into it. The old era is dying, and now their two figureheads do battle to prove who really has the right to move on as the true victor. Who will rule the next age? But All For One still has tricks to spare. As it turns out, Tomura Shigaraki is actually the grandson of the previous holder of One For All before All Might, who was deliberately sought out by All For One to tarnish her legacy. This battle was planned for a reason. Just as he chose this moment in Kamino Ward to fight and reveal All Might's true decrepit form to the public. He doesn't just want to kill All Might, he wants to destroy him and everything the Symbol of Peace stands for. What follows is an earthshaking battle that sets the tone and atmosphere for the manga to come. The Earth trembles, chaos shakes the foundations, and all the cards are on the table. Things will never be the same after this battle. Even when All Might wins, as he always does, at the cost of his power and the villain loses and is jailed, like they always are, everything is different. It shouldn't really be, but it undoubtedly is. All For One is expended, generations of terror has finally been stopped. If anything, the heroes have come out ahead. They lost the pillar of the hero society, and the villains are still out there plotting and scheming. There is now an All Might shaped void in the world and nothing is going to be able to fill it. Now he must step aside and make sure the next generation will be up to the task. The future is more uncertain than it has ever been. There's a very good reason the chapters directly after this fight and the fall out are very lighthearted ones focusing on the students moving into dorms (because the school needs a better way to protect them) and yet still has to make a point that what happened is never going to go away. Things are different now that All Might is no longer the Symbol of Peace and All For One is finally imprisoned. The All Might era is over. And the manga has a distinctly different atmosphere from this point on. It really does feel like the end of the beginning. Of course I wouldn't recommend anyone starting the series to do so with this volume. Too many big reveals and dramatic turns happen here and there are far too many past references to brush aside for the impact to be felt. But for those following since the beginning? They are in for a treat. This is the best volume of My Hero Academia to date and the most important one to boot. Do not pass this one by. Highly recommended. Season 3 of the anime is going to be quite the experience when it gets to this material. I've also got a book of my own with plenty of action. It's the most fun you'll ever have on a planet with mud men. For anyone who was reading here last year knows, blog activity is about to slow down. This is the time of year when Lent begins. As a consequence I'll be staying away from social media and the internet for the duration. I'll still pop on to check e-mail and notifications, but won't be out and about. I will still be putting out a post every week for those of you loyal enough to stop by every week, but they will definitely be shorter and less involved affairs than usual. My attention will be on my writing and real life duties. Hopefully I will have bigger and better posts for you when my sabbatical is over. You can also still see weekly posts at the Cannon Cruisers site while I'm gone though season 2 doesn't start until March. That is the most you will see of me online. I want to leave you with a positive word, but all I have are anecdotes. So, here's a recent one. I live in an area full of miserable (not necessarily "bad") people who have only gotten worse as the years have gone on. The world hasn't turned out the way they were promised and they just don't know how to deal with it. The utopia they were promised decades ago never came to be and it is increasingly obvious that it never will. Depression is a natural result of hoping for things that are impossible. That said, for the first time in my life I have seen several different (and unrelated) individuals take a self-assessment and have begun to change their lives, seemingly unprovoked. One went to Confession for the first time since... longer than I've been alive. Another, who was a Richard Dawkins-style pop atheist during its peak a decade ago, has attended more than one Mass that I'm aware of. Others have started families and have realized what is important to be truly whole instead of just happy, and yet more have begun to recognize deep issues with the way they are living and realize they must work to turn things around. It was remarkable. This isn't to put a thumb in the eye of the non-religious among you but to point out how much the climate has changed in just the last decade. Where once sneering against the sincere and genuine was commonplace it is now filled with those too tired and worn down to simply not care anymore. They need something more. As well they should because the last few decades has been a vacuum of offering anything of substance. There is no utopia coming, but that is okay. There is still something to fight for and connect with. Those of you feeling discouraged or forlorn with the modern situation simply don't need to be. You might not see it yet, and you might not for years to come, but things are changing. After what the Western world has been through, it is more than due. Sure, entertainment and art is in the trash-- but it won't always be. Subversion is a parasite that can't live without a host body. It's been living off a corpse and has no blood left to drain. Subversion is dying because everyone has figured out the shell game. The ball has been pocketed and the audience was scammed from the get-go. Remakes and relaunches are all that remain because the audience's trust is gone. And as they realize the creators' remakes are far worse than the originals it will only hasten the decline. Subversion has killed itself, but it's not over yet. It's time to start building and to give that little bit to those that are awakening and looking something more, anything at all. We need to help them discover a bigger universe than the one they were fed on--the one that pulled them into the mud, spat in their eye, and told them misery was good, ignorance is strength, and slogans are knowledge. That universe is a dry husk in the desert sun. Ours has hope and a future that connects with a long-standing tradition. The choice is obvious. We appear to moving on from the cynical, super irony (superirony?) age into a more hopeful and positive one. It's only a matter of time. Soak it in. There is more to life, never forget that. I'll be enjoying my copy of Miami Connection to remind myself. You could always read my most recent book. Think of it as Streets of Fire with more action and less Boomer-isms. This is a magazine I've been trying to get to for a while now. Unlike previous reviews of Cirsova and Astounding Frontiers, this one is a bit different. 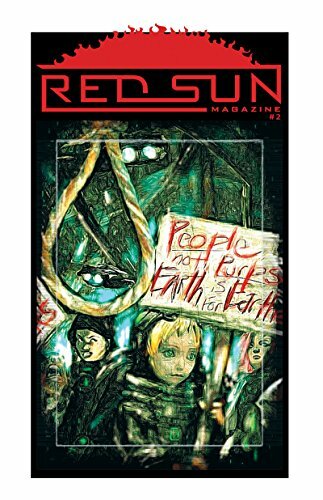 Red Sun Magazine is a unique case where every one of the three available issues have a distinctly different focus. But they all share one aspect that peaked my interest in that they are not obsessed with genre segregation and are interested in exciting stories. I chose Issue 2 specifically for being focused on Fantasy, which is a genre that needs a real pulp shot in the arm harder than SF and Horror do, in my opinion. I was not disappointed. Well, mostly. There is one story I did not enjoy, but I will get into that when we get there. One thing Red Sun does differently than Cirsova or Astounding Frontiers is that they have interviews and articles sandwiched between stories. These are all centered on the same genre the issue focuses on as well as authors and creators in the same vein. This issue starts with an interview of the men behind from the Cromcast which is, as you can guess, a podcast focused on the late and great Robert E. Howard, as well as other Weird Fiction tales. It was a delightful read which made it a great piece to start off the magazine. Next was an article titled "Why Write Fantasy?" by Judith Field which further put the lean on the Fantasy side of the magazine. This is just what the doctor ordered. The piece tackles an aggravating trend from literary types to classify Fantasy as lesser entertainment reserved for the ignorant and lesser folk from their "real" stories. It was pleasant reading a rebuttal of these claims that feel like they could have come from Chesterton himself. Fantasy is a way of connecting with a higher place than the one you're already in. A wider and bigger world is presented to entertain and thrill the reader. It hopes to pull you in and show you grand visions you might never have believed possible. This should be the aim of fiction--to give the reader a dose of imaginative excitement. After all, what is wrong about wanting to find something more than modern life? The third piece in the magazine is another article, this one titled "Is Fantasy Hocus Without Pocus?" by Karen M. Smith. This one is about magic in fantastical stories and if it is necessary for the genre. I was a big fan of this article. The discussion of magic leads to a lot of blurring of the lines into what distinguishes Fantasy from Science Fiction or even Horror. Sub-genres and certain quotes are bandied about but no actual definition of Fantasy that sets it apart from other genres can really be found. She comes to the (in my opinion, correct) conclusion that these categories don't ultimately matter. Of course this leads to all kinds of (really silly) arguments, but the truth remains the same. Genres blend because they are interchangeable. In this reader's opinion, that is because all genre fiction is the same genre. The only distinguishing aspect is in the tone, trappings, and language used. Yet they all contain fantastical worlds and journeys with imaginative concepts not available to those trapped in "reality" or the plainness of (post)modern fiction. The only ones splitting the difference appear to be those who like one trapping above the others and want to elevate it in response. But this is a pointless task. They are all one and the same, and the sooner we can put that behind us, the sooner we can get back to focusing on ignoring artificial boundaries and getting sales back up again. It is after this that we finally get to the stories. Thankfully, the issue only kept the quality up. Up first is The Phonebooth by Michael Reyes. I recognize the author from Cirsova, and his tale did not disappoint. This is about an ex-convict answering phone calls from very mysterious parties as the world undergoes very strange changes. I was reminded of The Mothman Prophecies with how a creature far beyond the world of man attempts to communicate and influence events in our world in ways we couldn't possibly understand. There's a very good reason for that similarity, but I don't want to give the game away. Very nice horror bent in this one and a great first story to start with. After that is Earth is for Earthers by Alexis Lantgen. Genetically modified humans return to Earth and things change... or do they? As for the positives... it was well written. I do think I would enjoy other stories from this author. That is all I can say. As you can tell, I did not like this one. I began to predict every plot turn before it came until it lead to an ending that was rather flat and pointless. This is a story where you could remove all fantastical elements and the story would more or less be exactly the same. That's one of the core problems, but it was also too predictable. You can get a story like this--a real world analogy to racism and immigration only transplanted to aliens--just about anywhere. You can get a story of forbidden love that ends with suicide of both parties just about about anywhere. You can get a story where every "bad" person is treated as stupid and every "good" person is a noble victim just about anywhere. You can get a story about a mopey protagonist that does nothing while a plot happens around them just about anywhere. And that's not a good thing. You can read another story like this just about anywhere. This was a waste of the author's talent and Red Sun Magazine. I hate to be harsh, but stories like this are my least favorite kind, especially when I can tell where they are going before the author even gets there. Of the four tales, this was the weakest. The third story is Body of Evidence by Ben Howels. In this one a magistrate is murdered and a trial has been enacted to sentence the perpetrator. But is he really the killer? This one is written in a Fantasy setting, in keeping with the theme of the issue, and it is a banger. The tension increases as the mystery unfolds and the characters are given a lot of personality through their natural discourse. There is a good quick ending that is very satisfying making this a good pulp tale. Last is Sanguinary by Kevin Weir. Here we have a blood mage mercenary in an urban fantasy setting that is two steps away from being cyberpunk slaughtering gangsters to save a young girl. I don't think I need to add anything else to state that it spoke to me. This story was good fun and ended the issue off right. Personally, I feel this should have been the cover story. It has good atmosphere and an engaging magic system that really sets the imagination off. I definitely hope to read more stories about this character in the future. Speaking of which, the magazine ends with an interview of the author of the very story in question. It gives quite a bit of context as to where the idea came from. I was impressed with this issue of Red Sun Magazine. 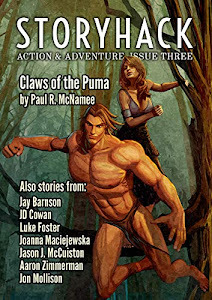 I had not heard much about them before, and I noticed they have relaunched their website, but they do have a lot of promise as a short story fiction magazine and a lot to set them apart from others. I highly recommend checking them out and keeping an eye on Red Sun in the future. I'm expecting great things. For those that enjoy action, I have one of my own!